Today is March 15, also known as the "Ides of March." You might recall hearing the phrase in school, during a lesson in English literature or Roman history. Do you know where it comes from? The famous phrase comes from William Shakespeare's play "Julius Caesar" and is muttered by a soothsayer who warns Caesar of an assassination plot to end his life. 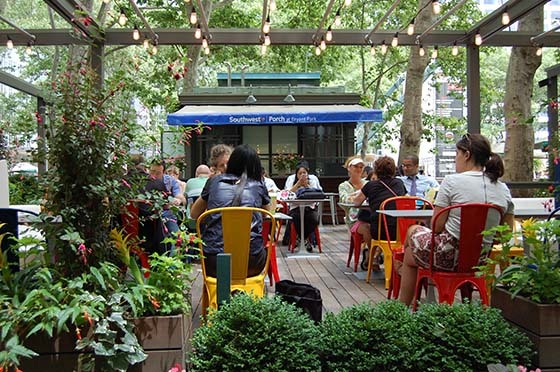 (If you're a fan of dramatics, be sure to check out Bryant Park Shakespeare returning this summer, when The Drilling Company will be putting on three of his most famous works this summer.) Later in another scene Caesar passes the soothsayer and jokes, "The ides of March have come," to which the soothsayer says, "Aye, Caesar; but not gone." Sure enough, by nightfall Caesar has been killed by his former friend Brutus. Aside from the passing connection to our Shakespeare series, how does this Roman holiday relate to Bryant Park? First let's talk about what "ides" actually are. Ancient Romans didn't number days sequentially like we do. Instead, they had set points throughout the month from which they would count days backward or forward. The Ides of March marked the 15th day of the month. In ancient Rome, the Ides of March celebrated a goddess of time called Anna Perenna. Her name is so associated with time that it's where we get the words annual and perennial from. Because Spring is upon us, we're gearing up to plant our own annual and perennial flowers. The chrysanthemums in front of the library are herbaceous perennial plants and wont start blooming until early fall. To celebrate this holiday, revelers would travel out into the wilderness, build leafy huts out of branches, set picnics, and drink as they prayed to Anna Perenna to grant them as many years of life as cups of wine they could drink. While we don't endorse taking branches from trees in the parks, we do have a very leafy wooden pergola at Southwest Porch which makes for a wonderful space to lounge, eat snacks, and enjoy a glass of wine (in moderation). Southwest Porch is equipped with swings and lounge furniture, all the more helpful to enhance the lounging experience. A less macabre way in which Romans observed the Ides of March was by settling debts. And as tax season is approaching and wallets are getting a little slimmer, be sure to take a look at all of our budget-friendly programming. As a New Yorker, you get a little reprieve because none of your tax money goes to Bryant Park. The Park is entirely financed by private money and you get to truly enjoy it for free. 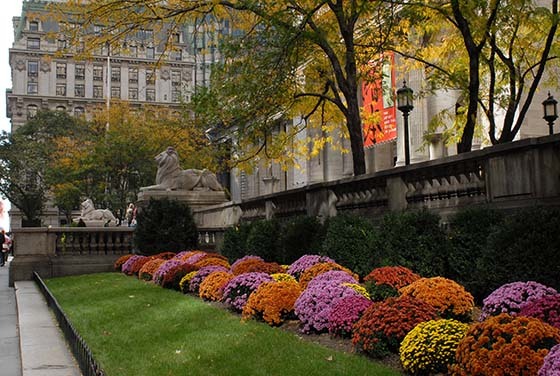 Of course, if you want to read more about Roman history, annuals and perennials, or personal finance, the New York Public Library is a great source of information. In fact, the NYPL is constructed in a Beaux-Arts style, which draws on classical Roman and Greek forms to convey a sense of history and gravity. Take a look around the NYPL facade; you'll recognize columns, Roman cattle skulls called bucrania, and myths like Jason and the Argonauts (ok, that one's Greek) decorating the lamp posts on the Fifth Avenue Terrace. And the final way we relate to this Roman holiday? Well, we've screened the famous film by the same name during a past season of our HBO Summer Film Festival! So, pay us a visit if you're looking for a way to acknowledge the Ides of March.